Cult of Kiln | Arts and Culture | Style Weekly - Richmond, VA local news, arts, and events. In New Kent County, the Old Tavern Kiln Collective reaches back to the past while planning for the future. Scott Elmquist John Bryant opens the door to his wood-fired kiln that can get as hot as 2,400 degrees and bake hundreds of pots at a time. On a farm 13 miles east of downtown Richmond, John Bryant's vision is taking shape. Half in sunshine and half cloaked in the shadow of a shed roof, roughly a dozen people have gathered to further Bryant's hopes of bringing others to his family's land in New Kent County. He preaches ideas of community and togetherness. He preaches of turning Old Tavern Farm into a space for the public to enjoy. He preaches about pottery. Two years ago, Bryant and others began working to build a wood-fired kiln on the farm. Now the six-member Old Tavern Kiln Collective is inviting the public to watch as hundreds of pots are pulled from the kiln for sale. From the outside, the kiln is roughly the size of a Hummer and resembles the cantina from "Star Wars." Inside, the temperature can approach 2,400 degrees, baking somewhere between 500 and 800 pots in the course of a few days. A week ago, Bryant and others started taking shifts working 80 hours straight, stoking the wood in the kiln every five to 15 minutes. "On Saturday we're going to be 'The Walking Dead,'" Bryant says in advance of the firing. "Wood firing is a community effort." For these artisans, the extra effort will be rewarded with the distinctive pottery the wood-firing process produces. Instead of the shiny, uniform look that electric firing creates, the ash from wood-firing coats each pot in its own unique glaze. The placement of a pot in a wood-fired kiln affects the design, as does the type of wood burned. "It's very unique, and it can't be replicated in any other way," Bryant says. "People either love wood-fired pots, or it's not their thing. They want fiesta-ware." For this firing, the collective burns cherry, red oak and pine. Oak gets the hottest, and burns at an even rate. Pine burns hot and quick, but has a long flame which reaches to the back of the kiln. Cherry — as well as other wood from fruit trees — creates a nice ash color. Bryant says there are only about a half-dozen wood-fired kilns in the Richmond area. "It's more of a primitive sort of firing," says Paul Klassett, a collective member who teaches pottery at the Visual Arts Center of Richmond. "They've been firing this way for thousands of years." For her piece, Keyser Glancy added pieces of blue glass to a pot that resemble barnacles on a pier piling. She hopes the glass will melt and drip down her piece during the firing. "The only thing I can control is the shape of the piece and where I put the glass," Glancy says. "I truly have no idea what it's going to look like. It's part of the fun." The public can watch the outcome Sunday, when the pots are unloaded from the kiln and put up for sale. Old Tavern Kiln Collective has worked with GrowRVA to create an event that will feature food trucks, a farm stand, a petting zoo and local bluegrass and country-roots bands. Other artisans will be on hand to peddle their wares, and the collective will sell wood-fired pizzas. The event is just one step toward Bryant's vision for the land. In the fall, he hopes to have the farm open to the public on the weekends. He wants to sell natural and organically raised produced and livestock on the farm. The collective also is working to convert an old barn into a gallery and artist studios. He aims to have everything up and running in the next two years. 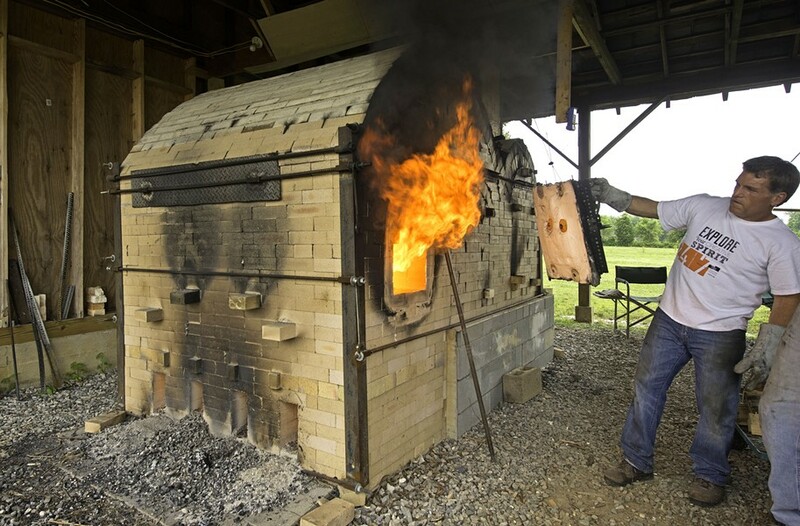 Old Tavern Kiln Collective's wood kiln opening is June 8 from noon-4 p.m. at 8400 S. Quaker Road in Quinton.